Manager Whitey Herzog bluntly opposed the notion of the Cardinals signing Bob Horner to replace Jack Clark. Too bad management didn’t listen. The move turned out to be one of the Cardinals’ biggest personnel flops. Plagued by a damaged left shoulder, Horner, playing first base and batting cleanup for the 1988 Cardinals, lacked Clark’s pop, hitting three home runs in 60 games. By mid-June that year, he was through as a major-league player. Clark, the slugger who powered the Cardinals to two National League pennants in three years, indicated after the 1987 World Series he hoped to stay with St. Louis, but as talks dragged on he became miffed by the club’s negotiating tactics. Though the Cardinals eventually offered him more money than the Yankees did, he signed a two-year, $3.5 million contract with New York on Jan. 6, 1988. Without Clark, the Cardinals lacked run production. In 1987, St. Louis had averaged 5.3 runs per game with Clark in the lineup and 3.6 per game when he wasn’t playing. Maxvill also approached the Dodgers about slugger Mike Marshall, but when they asked for infielder Jose Oquendo and reliever Ken Dayley in return, the talks ended, Maxvill told Rick Hummel of the St. Louis Post-Dispatch. Meanwhile, Horner, 30, wanted to return to the major leagues after playing for the Yakult Swallows of the Japanese Central League in 1987. He rejected the Swallows’ offer of a multi-year contract after he hit .327 with 31 home runs in 93 games for them. In nine seasons with the Braves before his year in Japan, Horner compiled a .278 batting mark and averaged 24 home runs a year. Horner had hit 142, or 66 percent, of his big-league homers in Atlanta. Though he had a .325 career batting mark in 118 at-bats at St. Louis’ Busch Stadium, he had hit just five home runs there. The combination of Herzog’s resistance and Horner’s demand of a multi-year contract cooled the Cardinals’ interest. Horner had offers from the Braves and Rangers, but the Junction City, Kan., native preferred St. Louis. Concerned the opportunity would slip away, Horner called Maxvill and said he’d take a one-year contract. Maxvill said that was fine but a deal needed Herzog’s buy-in. Horner called Herzog and they spoke for about 20 minutes. He told Herzog he wanted to be a Cardinal, that he could help the club and would sign for less than what Clark had wanted. Herzog gave his approval. The deal was announced the next day. Herzog still had concerns. He explained to Hummel that Cardinals pitchers facing Horner at Busch Stadium were instructed to give him pitches away so he’d be more likely to hit to the deep outfield gaps rather than pull balls over the wall. “He’s got a good home run swing, but will he be able to hit the ball out of the park in right-center and left-center?” Herzog asked. The Cardinals opened the 1988 season on April 4 at Cincinnati. Herzog recalled the poor impression Horner made that day. “I called him Buddha,” Herzog said. “He was a little on the portly side and spent a lot of quality time slouched in his chair in the clubhouse … I had a rule that everybody took infield before the game, but I didn’t see Horner out at first base, so I went to the clubhouse to find him. 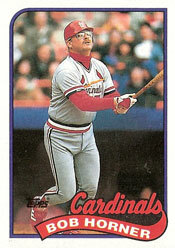 Horner went homerless in 31 games at St. Louis in 1988. His three homers that season all were solo shots on the road. Horner underwent two shoulder surgeries that summer. The Cardinals started 10 players at first base. In August, they solidified the position by acquiring Pedro Guerrero from the Dodgers for pitcher John Tudor. After the season, Horner wasn’t offered a contract by the Cardinals. The Orioles invited him to spring training, but on March, 9, 1989, Horner, saying shoulder weakness limited his ability to play, announced his retirement.